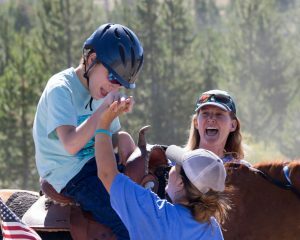 Therapeutic riding involves teaching riding skills to riders with disabilities, with adaptations as needed. The primary goal of therapeutic riding is to learn riding and horsemanship skills. However, as the movement of the horse is inherently therapeutic, riders frequently enjoy secondary benefits such as increased postural control, balance, strength and speech. Participants must be independent and manage self-care or bring a care-giver to provide assistance. Beginner Lessons – The skills that will be learned during these lessons encompass the basic fundamentals of the sport including grooming and tacking, mounting, balance and body control and stopping/steering at a walk or trot. *Maximum rider weight is 200 lbs. Intermediate Lessons – Intermediate riding lessons offer participants a way to further advance their riding and prepare for more advanced skills, such as further development of your seat and hands, transitions within the gait and more complex steering patterns at a walk or trot. *Maximum rider weight is 200 lbs. Advanced Lessons – Unlike beginner or intermediate lessons, participants will focus intensely on how they affect the horse. For this reason, participants in advanced lessons must have balance, body control and a complete understanding of how the horse’s body works. The NSCD riding instructors must approve all advanced participants for lessons. *Maximum rider weight is 200 lbs. Times: 8:30 a.m. | 9:45 a.m. | 11:00 a.m. | 1:00 p.m. | 2:15 p.m.
*Listed prices are per person, for group lessons. Private lessons are available for an additional fee. 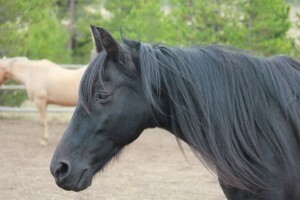 Ground therapy is built around interactions with horses. This type of therapy can be used to assist people with mental and emotional difficulties, including anxiety and mood disorders, Post-Traumatic Stress Disorder (PTSD), behavioral challenges or undergoing life transitions or losses. Enjoy the fun of horseback riding on our scenic trails. 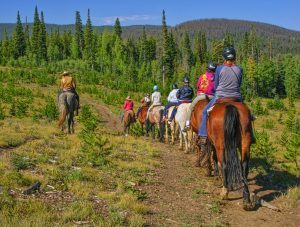 Our one-hour trail ride is an ideal way to view the beautiful Rocky Mountains while visiting Grand County, Colorado. Love horses? 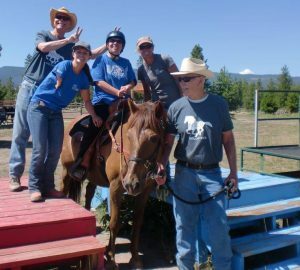 Join us at the NSCD Therapeutic Riding Center for a camp that includes horseback riding, cookouts, campfires and tent camping. Campers will learn to lead, groom, tack and ride a horse. New skills learned in the arena will be enhanced while out on daily trail rides. **Maximum rider weight is 200 lbs. Horse camps are popular, register early. Additional for this camp: On July 4th, campers will attend the largest, small-town parade in Granby, followed by a picnic in the park and an evening at the rodeo. Additional for this camp: This camp includes a day at the Middle Park Fair. 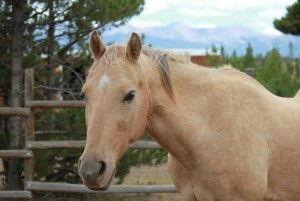 Consider sponsoring one of the therapy horses through the Sponsor-A-Horse program. 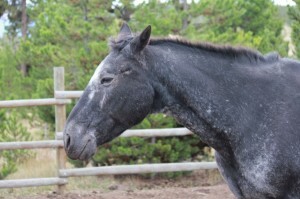 The cost of maintaining a special therapy horse is approximately $150.00 per month. Costs may include boarding, feed, farrier and veterinary costs. 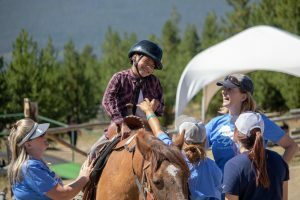 The Sponsor-A-Horse program gives corporations, groups and individuals the opportunity to support the “backbone” of our therapeutic riding program – the horses. If you sponsor a horse for three or more months ($600), you will receive two free rides during our summer season. 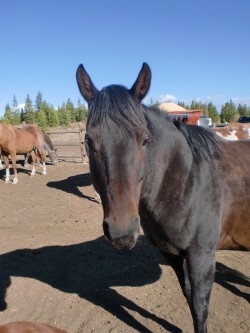 Please contact the NSCD if you would like to sponsor a horse or if you have any questions. 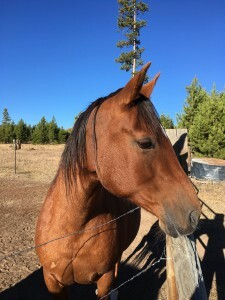 Montana: Montana is a sweet girl. Our riders love to trot on her. She is the princess of our herd. Blackie: Blackie’s calm demeanor and willingness to work make him a great horse for a variety of our riders. He loves to go out on the trail. Chestnut: Chestnut is the head of our herd. He is a retired U.S. Forest Service mustang. Yogi: Yogi LOVES children! He has a very sweet disposition. 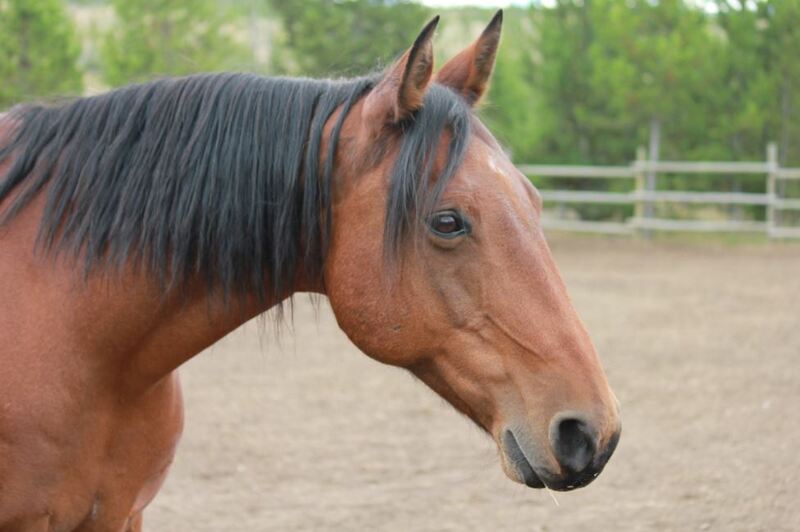 Cassie: Cassie joined the NSCD herd in the summer of 2016. 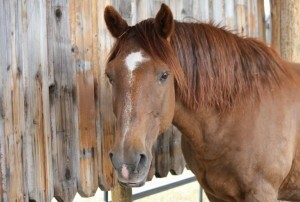 She is a sweet girl and a fun ride as she is a Missouri Fox Trotter. We thank Carole and Gerry Gillen for donating her to our program. Pepe: Pepe (also known as Peppy) is a sassy retired barrel racing champion that challenges our most advanced riders.